Home > What is the difference between THC and CBD? Tetrahydrocannabinol (THC) and cannabidiol (CBD), types of cannabinoids, are the two main ingredients found in the marijuana plant. Cannabinoids are active chemical compounds, more than 100 different types of which have been classified. Of these, THC and CBD are the two most prominent unique active ingredients in marijuana, with the former being the most widely known for a long time. Both THC and CBD are the most talked about ingredients in cannabis — with their fame well earned. But what are THC and CBD exactly, and what are the difference between these two? Researchers have identified more than 500 compounds in cannabis, and as noted above, over 100 of them are cannabinoids. These affect the endocannabinoid system of your body in unique ways. They have distinct molecular shapes that fit the receptors in our body’s hormonal communication systems. This allows them to regulate our mood and appetite, among other things. This is how marijuana can reduce pain, restore appetite, and calm chronic seizures — most notably in patients undergoing serious treatments like chemotherapy or those that are enduring AIDS. However, at least one therapeutic cannabinoid molecule is not mood altering at all. 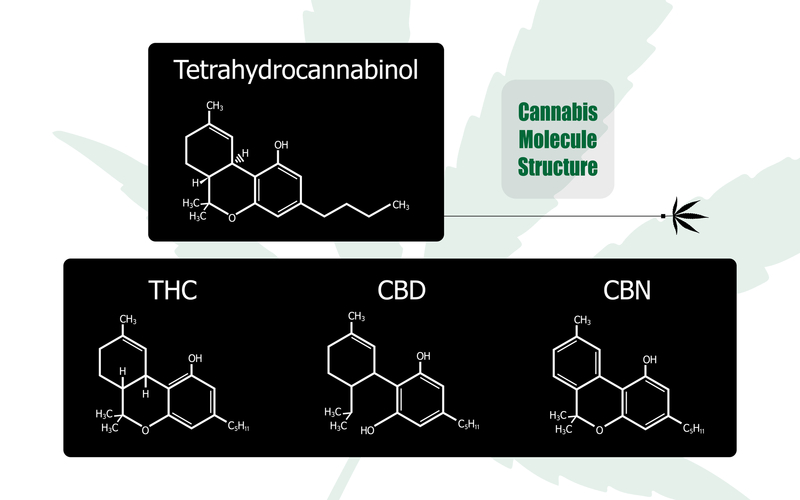 The simplest difference between these two is that although the two compounds work together and complement each other, THC gets you high, while CBD does not. In fact, CBD mellows out the potentially negative effects of THC. But to truly understand the distinctions between the two, you will have to have an idea on how the two compounds work. How these cannabinoids effect your body’s endocannabinoid system when they enter your body and naturally bind to the receptors that are designed specifically to interact with these cannabinoids. This communication between cannabinoids and endocannabinoid receptors is what triggers the number of different effects — whereby some people feel high, sleepy, or even mentally stimulated, while others experience pain relief and a few other types of medicinal effects after taking these substances. That is to say, THC and CBD are among the most important compounds in marijuana, and they are largely responsible for both its recreational and medicinal effects. Now that you have a basic understanding of the chemistry, let’s get into the specifics of THC and CBD. THC is the chemical that gives marijuana its psychoactive properties. In other words, this is what makes you feel high when you take weed. As you can see, it’s not all milk and honey — THC often produces effects that are overwhelming, like feelings of anxiety and paranoia. Luckily, other cannabinoids, like our friendly neighborhood CBD, help balance it all out. It was only during the late 1980s that scientists learned what THC really does. The brain has receptors, called CB-1 and CB-2, and they help regulate things like appetite, mood, memory, and pain. THC actually binds to these receptors, and that is why it creates the sensation of being high. Likewise, consuming this chemical also leads to an increase in appetite, and it can also help with pain management, as well as in the treatment of various psychological disorders like PTSD and depression. CBD is where things get interesting. That’s because several medicinal properties of this cannabinoid were mistakenly attribute to THC in the past. But continued research has revealed that CBD is actually responsible for many of these health and medical qualities. Qualities that make it ideal for the treatment of conditions like nausea and vomiting, seizures, inflammation, depress, diabetes, arthritis, even some tumors and certain types of cancer cells. But one of the biggest surprises was the revelation that CBD actually balances out many of the adverse effects of THC like reducing anxiety and memory loss that some people may experience. So much so that cannabis breeders have focused on creating strains with high CBD for medical marijuana designed for patients that don’t want to get high. Differences between THC and CBD. THC and CBD have both been proven to effectively reduce acute chemical, mechanical, and thermal pain, while they can also significantly alleviate chronic pain. And there are different types of cannabis available that people can choose, whether they want to get high or not. The unique factors of both compounds, then, are what define the key difference between THC and CBD. For instance, THC is a believed to have effects that promote sleep, while CBD results in wakefulness. This is why some strains make you feel active while others turn your drowsy. THC also acts as an anti-inflammatory agent, muscle relaxant, and a compound that stimulates appetite and euphoria. Not to mention its remarkable effectiveness against pain relief. CBD, meanwhile, is also helpful in pain relief, but it has also been proven to reduce nausea and anxiety, and provide a calming effect to users. Another notable difference between THC and CBD is in how these are derived. CBD is naturally taken from industrial hemp and cannabis plants, while THC only comes from cannabis plants, primarily the Indica, Ruderalis and Sativa species. These clear differences also come into play regarding the legal status of these two compounds. CBD, as an example, can be extracted from hemp, which is legally imported and sold in the US. Ultimately, while both strains have medicinal benefits, if you want to get high, you should opt for the cannabis plant that is high and rich in THC.